Highly engaging and hands-on sales seminars transfers skills from the learning to earning environment. On-site sales training and coaching to build your high performance team. The best customer experience produces the best business results! Thanks Dan... We sold 46 of our 102 cars for the month [in the 7 days] after you left here. Everyone has an activity plan and a results goal for the month. One on ones have begun and I can already see the walls between management and the struggling sales staff come down. We'll have a quality training meeting on Friday. Thanks for your help. Approval ratings on the Automotivaters facilitators and content consistently score higher than 95%. Powerful testimonials from students continue to come in from every program! I highly recommend these programs to maximize the performance of your team and the profitability of your dealership! I have now been in the car business for two months now and had a very successful start. In my first month of July I sold 18 units and in the month of August my number was 19... I want to thank you for sharing your expertise and knowledge. I owe all to you for such a successful start. Jared was excellent, his positive encouraging approach was taken on well by the team. This meant that there was good 2 way dialogue and the guys came away with a good positive feeling from his time with them. Jared managed to get great buy in from our team. It was like finding a new source of energy when you were with us. As always I feel totally inadequate when someone as competent as yourself offers such excellent direction to our sales team... your assistance and direction was fantastic. 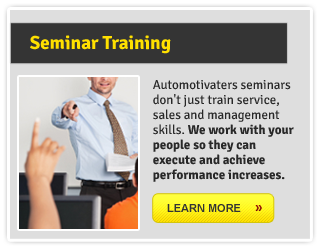 Automotivaters always puts on a great seminar. I always leave with things to improve on and get better. Every manager needs to take this course! Cam was a very strong, clear communicator of the information. He was very effective in using situations and different examples to get the message and information to us. Very helpful even after 18 years in sales. Win is an excellent facilitator!! After today's seminar I am a better salesperson. The information taught was extremely helpful, Win delivered quality material, very knowledgeable. This course really opens up your mind to the full potential of the auto sales industry, the sky is the limit. Can't write much, "Invest 8 Hours - pay raise 30%" . Thanks. ...we produced 30% more overall gross on half the volume and still maintained market share. That absolutely could not have happened without the right processes for these times. Thanks for the brilliant training yesterday. Immersing as we speak. Will definitely implement your suggestions. Conversational and relationship building dialogue throughout the process Fun in training. Conduct some great role playing exercises. Thanks again! Whether you are 3 months in the chair or 30 years in the chair, if this course becomes available to you, it should be non negotiable to go to it. A comprehensive, detailed presentation of the procession selling automobiles from A-Z. A must have if you want success in this industry!! Well done Randy! This program really motivated and provided me useful information on how to become a better service advisor... the session gives us a lot to think about and apply to our daily jobs. Automotivaters? We use your free stuff in our meetings all the time! Just a quick note to express how happy I was to have coaching last Friday... with his common sense approach and little ideas to help the sales team to think on their feet. Cam was extremely knowledgeable, engaging and helpful throughout the whole process. I took this course before I started in the automotive industry and it helped me be a great salesman my first year and now this (advanced) course will help me be even better. Automotivaters is great training. I always leave refreshed & motivated. Amazing Course! 3 hours into my first shift following their process, I was able to handle questions efficiently and do a proper qualification with my customer, brought the proper information to my Sales Manager and were able to work within the customers' Terms to Own and get a deal done! Don't miss their courses, even if you're a seasoned vet!!!! Dan, Not sure if I ever had a chance to thank you for all of the excellent training you gave to me... it was definitely one of the keys to my success. Dave's knowledge, energy, passion and steadfast dedication speak for itself. This is a must have course for the beginner or seasoned veteran. It was an honor and a privilege taking this course. We finished on 26,977 yesterday vs. target 26,900 our 4th consecutive sales record and now 8 years of annual sales targets met. A large part of that success is due to the partnership between us, TNZ and Automotivaters as we lift the professionalism of our sales team here in NZ. Great value, Great Content. I've taken a lot of training over the years, love the way they deliver the material, very interactive. Great Job! For an individual like myself who is experienced, courses like this are important training tools to keep up with the ever changing car business. Keep up the great work! Thanks again for your input into our dealership group with your training. The feedback here is fantastic and something we will work hard to get sorted for next time you come. I attended a 2 day Business Manager workshop on behalf of Northland Toyota a couple of weeks ago down at Toyota Finance! Automotivaters traveled all the way from Canada to take our training & it was such a good experience... So many opportunities and areas within Toyota NZ & Toyota Finance, I can’t wait to expand my knowledge & learn more. 2018 ended on a high note for new vehicles - a 7th consecutive record year & 31 years at #1. Plus the successful implementation of both Toyota Experience/Drive Happy and a Hospitality strategy across the entire dealer network. A large part of that success is due to the partnership between TNZ, TFS and Automotivaters as we continue to lift the professionalism and performance of our sales team here in NZ. Chad Isaac is always good and passionate with his delivery and look forward to being on another course with him in the future. Learn more about enterprise solutions for national sales companies, manufacturer networks, retail dealer groups, and dealer associations. Learn more about how our automotive industry leaders in training and management development change behaviour to produce sales results. Learn how to leverage your loyal customer base with high volume and high CSI Private Sales. Shorten trade cycles for more vehicles more often. Learn more about the most realistic and highly experiential event that assesses and coaches every step of the sales process. Automotivaters 4 days 13 hours ago. Not skilled at transitioning from introductory conversation to a professional interview at our desk? Everything following is compromised. Automotivaters 6 days 13 hours ago. Sales results come down to preparation and desire. Preparation is technique, practice, and effort. Desire is that attitude or drive to win.